After over a decade of “Friends of Norfolk Wherry Brass”, 2015 sees a modern and exciting change to our loyalty scheme. Gone are the old membership cards and yearly subscriptions in favour of a new, simpler method of keeping abreast of all things Wherry! Our new mailing list is free to subscribe to and delivers the latest news from Norfolk Wherry Brass as it happens meaning you’ll never miss a thing. Each edition features information about all of the band’s upcoming engagements as well as linking in with our social media accounts with shorter, more regular updates. Visit our subscriptions page to sign up today or use the form on the right hand side of this page. Brass bands are expensive to run and being an entirely self-funded operation, we rely solely on income from member’s subscriptions, concert revenue, grants and donations. This is where you can help! 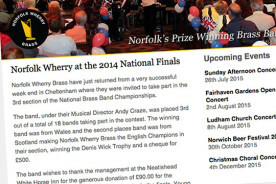 For a one-off fee of just £10 you can become a Patron of Norfolk Wherry Brass for life. In exchange for this you receive your special patrons card entitling you to discounted entry on just about any concert we put on as well as other little perks and surprises. Of course if you’d like to donate more money then that’s absolutely fine too! For information on how to join, please get in touch or speak to us at our next engagement.